GOLF COURSE location! Everyday life here is like being at Augusta National! Masterfully situated an iron shot away from # 4 on the beautiful & challenging Lakes Course. This cozy comfy Camelback model sports 2 master suites and every imaginable amenity. Nothing needed & FAST move-in. Recent improvements include: NEW Master Bath 2/16, ROOF membrane re-do 7/15, NEW Water Heater 4/18, NEW Security Door 3/14, NEW Window Treatments 12/16, NEW Washer & Dryer 2/17. Don’t be a spectator. Get your game on & see what is all teed-up just for you! Directions: 91st Avenue – North to Westbrook Village Pkwy. West to Escuda Drive. Right to Property. Approximate size: 7200.00 sq. ft. Please, send me more information on this property: MLS# 5905011 – $380,000 – 9403 W Escuda Drive, Peoria, AZ 85382. 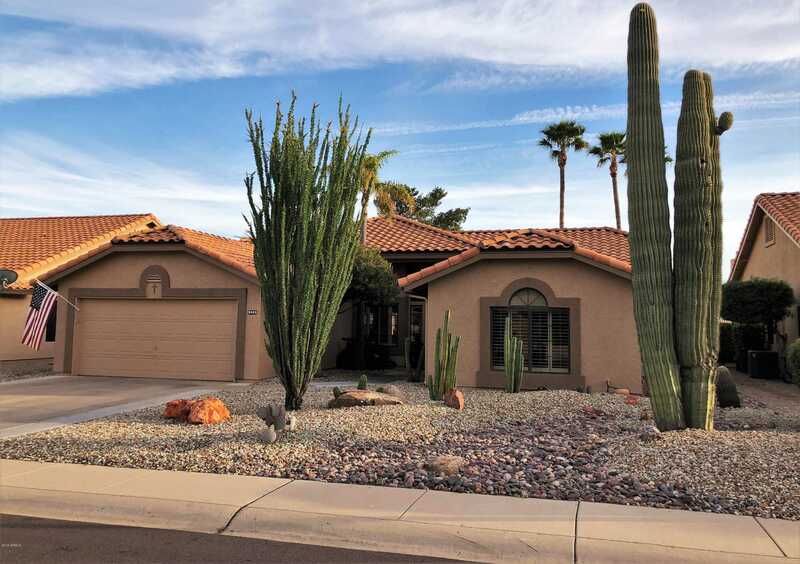 I would like to schedule a private showing for this property: MLS# 5905011 – $380,000 – 9403 W Escuda Drive, Peoria, AZ 85382.